Jungle trekking is a great way of exploring Gunung Leuser National Park, seeing wildlife up-close and learning about North Sumatra’s ecosystem. If you love adventure, exploring jungle, learning about flora, fauna, and culture then Bukit Lawang is the best place to go. It is one of the hidden paradises of Indonesia, often referred to as ‘Orangutan Country’. BUKIT LAWANG ADVENTURE arranges jungle trekking tours through the rainforest of Gunung Leuser National Park, starting from the small village of Bukit Lawang. 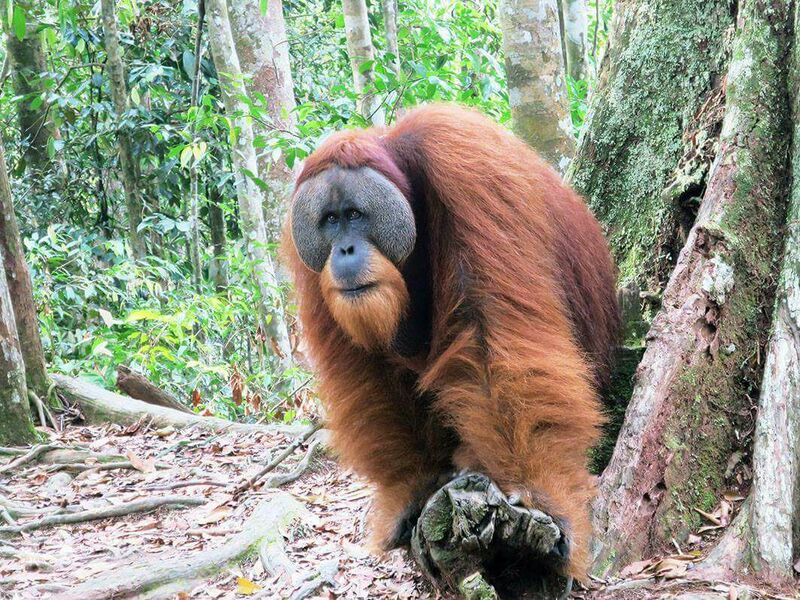 During these trekkings you have the opportunity to observe the endangered great apes (Sumatran orangutan) in their natural habitat, and discover many other species of exotic animals, flowers and plants. Bukit Lawang Adventure is very concerned about the wellbeing of all animals who call Gunung Leuser National Park their home. Therefore we only allow visitors in good health to go into the jungle, we do not feed animals and most importantly, we keep our distance. Bukit Lawang Adventure cares about the ecological foot print we leave behind. We make sure our jungle trekking tours do not affect any flora or fauna and that nothing (litter, rubbish) is left behind. Bukit Lawang Adventure only works together with licensed, experienced guides who are approved by ITGA (Indonesian Tourist Guide Association). Bukit Lawang Adventure offers a wide variety of jungle trekkings. From a three-hour walk for travelers who have very limited time, to a eight day jungle experience for the die hard jungle lovers. From 6 days we offer custom made jungle trekkings, so contact us for more information. This jungle trek is ideal for people who have very limited time, for people who are not physically able to walk or climb too much and for families with children. In about three hours you will still experience the beautiful nature of Gunung Leuser National Park and see some wildlife. You want to see wildlife (orangutans) and experience jungle, but you have limited time or you are not the sporty type? This slow paced trek takes around six hours, with many breaks. During this 1-day trek you will have a great chance of observing a wide variety of wildlife, which your guide will point out to you. This adventurous overnight trek in Gunung Leuser National Park is the most popular option to discover and really experience the tropical rainforest of North Sumatra. During this two-day trek takes you go deeper into the jungle, with great chances of seeing orangutans up-close in their natural habitat. Do you love hiking and nature? During this three-day trek you will get a truly unforgettable jungle adventure. You go deep into the National park and will have many opportunities to see orangutans and other wildlife up-close in their natural habitat. You will stay overnight in two different camps in the Gunung Leuser National Park. This four days jungle trek is a really great, but intensive jungle experience. You will have the best chances of seeing orangutans up-close in their natural habitat in the Gunung-Leuser National Park. And if you lucky in this trek you will see Sumatran elephants and Sumatran tiger. This very intensive five days jungle trek in Gunung Leuser National Park is for the die hard nature fans. During this five-day trek you will go very deep into the jungle, which gives you great chances of seeing many different species of wildlife up close, including the Sumatran elephant and Sumatran tiger.